You have just stepped off the airplane at the Miami International Airport. Your hands are full of carry-ons, checked baggage, and other miscellaneous items. The last thing you need to worry about is finding your way to a car rental facility. Also, returning your rental car and reaching the airport in time for your flight is not any easier. Are you looking for free transport to and from the airport? If so, you have come to the right place! Family Auto Rental has recently changed locations, moving to the new Rental Car Center mere minutes away from the main airport building. Unfortunately, we can no longer offer a limousine or a bus shuttle service to pick up or drop off customers. We apologize. Instead, we would like to direct your attention to the perfect solution: FREE Train Rides at the Miami International Airport! 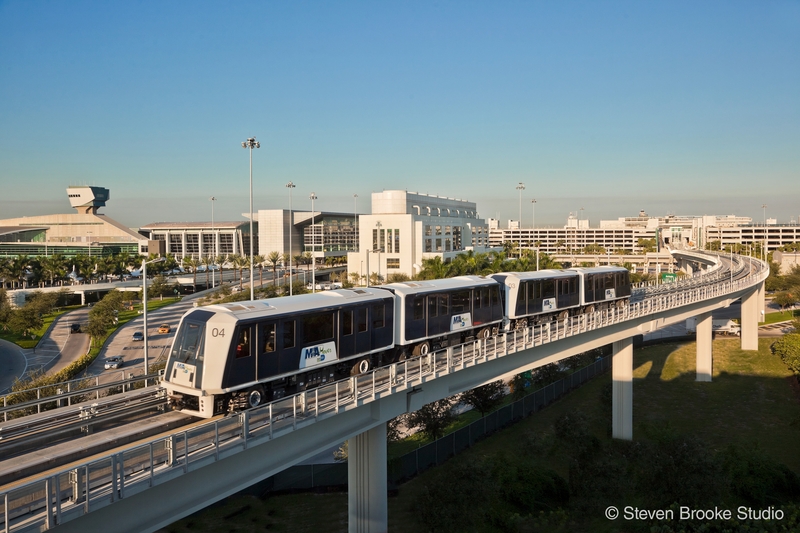 The free train, known as the MIA Mover, is a fully automated people mover that transports passengers from the airport to the Rental Car Center. The Mover is a state-of-the-art transport system that can move 3,000 passengers per hour, reducing airport traffic congestion by 15% and air pollution by 30% every year. Most importantly, arriving and departing passengers alike can have complete peace of mind knowing that their transportation needs are fully taken care of even prior to renting a vehicle or upon its return. Once you walk out onto the main area of the arrival terminal, take the elevator to the third floor and follow the signs for the MIA Mover – you can’t miss them. From there, follow a short walkway that will take you directly to the train, which will then bring you to the Rental Car Center. Proceed to the convenient fourth-level customer service lobby, where you will not miss the signs leading to our doors. Restrictions: There is absolutely no eating or drinking aboard the train. If you are renting a car from Family Auto Rental and would like free transport to and from the airport, please do not hesitate to call us at 305-638-9400 for more information on your free train ride today. Our dedicated team looks forward to ensuring your stress-free – and cost-free! – transfer between our car rental facility and the Miami International Airport.